→Rosemary Oil For Hair Growth: Does The Evidence Stack Up? If you are skeptical about chemicals and the dubious claims made around a lot of hair growth products, then like many people you may have been on a quest to find a natural and effective hair rejuvenation option. Or at the very least, something natural that stems the tide of hair loss, that isn't just yet another empty hope, and of course a waste of your valuable time and money. So what is the truth about rosemary oil for hair growth, and the scientific studies backing up those claims. Should you be considering using rosemary oil to stop your hair loss? If you going to make a great decision on whether you should spend time, money and effort embedding rosemary oil into your head growth armory, then it's crucial that we go through the basics of the science behind the claims about rosemary oil so that you can weigh the evidence up. Inflammation of the scalp and hair follicles can be reduced. Rosemary oil has antibacterial properties. DHT can be slightly decreased (a hormone that can promote male pattern baldness). It can prevent fibrosis (creation of excess fibrous connective tissue). It can help to increase localized blood flow. As you can see, all these could be beneficial in somebody's fight to slow, stop or possibly slightly reverse their hair loss. ​So it's little wonder that it's promoted in this manner, especially in the age of the Internet where a minor benefit can be inflated into a major miracle cure, through the online equivalent of Chinese whispers. ​This can only be a situation made worse when modern hair restoration treatments such as Minoxidil cost so much money, leading people desperate to stop hair loss grabbing at any possible solution. Rosemary oil contains antioxidants, has antibacterial properties and slightly decreases DHT – three excellent traits might promote hair growth. But the problem is that the study was not all that it appeared. The big problem was that the hair growth results were not as impressive as the studies abstract claimed, which is the only part of the study most people including the press bothered to read. After the six-month trial, the subjects using rosemary oil saw a 5.5% increase in hair count. Those using 2% minoxidil saw just a 1.7% increase. Although that sounds impressive, the problem is that the standard deviations were very wide making the whole thing statistically insignificant. So unfortunately when you look behind the abstract and the headlines, the study was flawed and the results not conclusive in any way. So in terms of science, the answer to the question "Does Rosemary oil help with hair growth?" is realistically "Maybe....”. The current fuss about rosemary oil for hair growth is based on a study from 2015. But unfortunately, the claims are not as impressive as they look on first sight. So Rosemary Oil Is A Waste Of Time To Halt My Hair Loss? Let's not get despondent here, because that scientific study isn't the whole story. Earlier I said how the active ingredients in rosemary oil can help the scalp in a variety of ways, importantly including lessening scalp inflammation. When our body tissues get injured, they release proteins called cytokines. These are known as "signaling proteins". They tell the cells surrounding the injury whether to reduce or increase inflammation. Increasing localized inflammation protects the cells and helps to start with cell regeneration. The damaged tissue also then releases an enzyme called COX-2. This also sends messages, helping to tell the body how many inflammatory cells should deal with the injury. Basically, the bigger the injury, the more inflammatory cells are required to do the job. As the injury heals, the counts of these two types of proteins starts to decrease and the cell count diminishes as healthy cells are grown. That's the recovery process in a nutshell. Where it gets interesting is that inflammatory response to an injury is different to a chronic inflammatory response. In the second case, the message to keep sending these enzymes doesn't stop, it might diminish, but it doesn't stop. That's why some ongoing issues such as ulcers often don't go away. In the case of our scalps, that's one of the mechanisms which drives hair loss. Chronic scalp inflammation, through a variety of causes, leads to scarring which starves the follicles of oxygen, blood and nutrients over time. This shrinks them over a number of years, leading to ongoing baldness. We still don't know what the main triggers for chronic scalp inflammation actually are, so the only way we can help is to reduce enzyme counts that leads to the inflammatory process happening. This is the reason why rosemary oil might be able to help with hair growth, or at least slow hair loss. 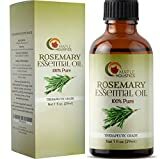 So in other words, the great news is that there is scientific evidence that rosemary oil can help to minimize the chronic inflammatory process. The more this process is minimized, the more we give the hair follicles a fighting chance. Thanks to its acids, rosemary oil protects the the scalp from (chronic) inflammation which is devastating for healthy hair. If you are suffering from thinning hair, then you will have heard about that horrible hormone DHT and how it can trigger hair loss. Although there are misconceptions, most of the evidence over many years of research does suggest that an increase in DHT within the scalp happens prior to hair follicles starting to wither and die. And the great news is that a study found that rosemary oil can help to block androgen receptor activity. This activity is where DHT binds, so lessening this activity will minimize the effect that DHT can have. Although the studies of only been conducted on mice and rats, the anecdotal evidence from use in humans is that the same benefits are found. ​The truth is that that currently that there is simply no miracle cure for hair loss. And unfortunately it appears that investing in 5% minoxidil (Rogaine) is a better bet. But that's not the whole story. ​The evidence, both scientific and anecdotal, appears to be that rosemary oil could havecomplimentary benefits to using minoxidil, and couldprolong the need for any hair treatment if used prior to hair loss really getting started. ​Rosemary oil does appear to have a mild positive effect on lessening the effects of male pattern baldness, and hair loss generally. Which makes it an inexpensive thing to at least try. HEALING ESSENTIAL OIL high grade rosemary oil concentrate is steam distilled & unrefined. Nourish & invigorate hair and skin as well as boost brain function for men and women of all ages. There are multiple ways that rosemary oil can be used on the hair, and when each is used consistently, it can help stimulate hair growth. Whether it is in a deep treatment or a daily spritz, rosemary is a diverse essential oil that can be used in a number of ways. Doing a hot oil treatment on the hair can allow the nutrients to penetrate deep into the hair follicle, locking in all the benefits for shiny, healthy, beautiful hair. To do a rosemary hot oil treatment, you'll also need coconut oil and castor oil. Take two teaspoons of both the coconut oil and the castor oil and heat until they are completely melted together. Then add a few drops of your rosemary essential oil. While the oil is still hot, massage the mixture into your hair, working from the scalp down. Be careful that the oil is cooled enough to handle, as the hot oil treatment shouldn't burn you or cause pain. Leave the oil to soak into your hair for about 15 minutes, then shampoo as usual. This treatment can be done every few days or once a week, depending on the hair type and the results you are looking for. If you'd like the benefits of rosemary oil every day, consider making this DIY leave-in conditioner. Begin with 1 cup of coconut oil in a clean, empty jar. Then add in about 20 drops of your rosemary essential oil. After showering, while your hair is still wet, take a bit of the oil mixture and rub it through your hair. Be careful not to use too much, as too much oil can make your hair appear greasy. For a truly deep conditioning experience, try out this rosemary oil overnight treatment. To begin, mix together 2 teaspoons of coconut oil with 1 teaspoon of honey. Next, add a few drops of rosemary into the mixture. Coat your hair in the mixture, beginning with the ends of your hair and working your way to the scalp. Once everything is covered, pop on a shower cap and go to bed! In the morning, shower the treatment away and reveal beautiful hair. How much rosemary oil is too much for my hair? In terms of the volume of rosemary oil you use, you cannot use too much on your hair. You cannot damage your hair by adding rosemary oil to it. The problem comes with washing the volume of oil out, the more you use, the more difficult it is to get rid of. In a common hair mask recipes for example, people use a few drops of rosemary oil with a half tablespoon of coconut oil. And when applying to hair neat, many people suggest using five drops on the hand, rubbing your hands together, and then gently running your fingers through your hair. Can I use rosemary oil in my hair more than once a day? The answer to this question is yes you can use rosemary oil in your hair more than once a day. But on the other side of this question, you don't really need to. Mix a few drops with your usual shampoo or conditioner and leave it on for slightly longer. Apply neat rosemary oil to your hair and scalp by putting a few drops on your hands and running your fingers through your hair. The bottom line here is that you can use rosemary oil several times per day in your hair with no ill effect. However as with anything, at some point it stops becoming beneficial because it simply cannot be absorbed any further. A single daily application should be fine.